And I've been using this adapter for my Dell XPS 13 9630 to connect to 2 external monitors and it works perfectly fine. Doesn't support 3rd monitor of course. So I connected my Macbook Pro 15 2018 to the same adapter and the two monitors are mirrored. Been looking a bit online and it seems like people say you have to use different ports on the macbook. And I'm really surprised to see that a 3 times cheaper Dell XPS can handle two monitors through one port, but the macbook only sees it as one external monitor. Ideally I'd want to have 3 FullHD monitors connected to this adapter, but I has to support at least 2 simultaneous monitors. So does anyone know how do I get them to work through one adapter? The Startech adapter you've got works as a MST (Multi-Stream Transport) hub. MST is a part of the DisplayPort 1.2 standard, which makes it possible for monitors and computers to support "daisy-chaining". Daisy-chaining is most often seen where the monitor has both an input and output DisplayPort adapter, allowing you to connect the first monitor to the computer, and the second monitor to the first monitor. If both monitor and computer support MST daisy-chaining the two displays will act as seperate displays, exactly like if they had been plugged in directly to the computer. Note however that the monitors share bandwidth, so you wouldn't be able to have them at the same resolutions and refresh rates as possible when using seperate cables connected to the computer. The problem for you is that macOS does not support MST daisy-chaining. I believe this is a software limitation and not a hardware limitation. Instead macOS supports daisy-chaining Thunderbolt monitors (such as with the Apple Thunderbolt Monitor). Therefore it is not possible to get your StarTech adapter working with macOS. Indeed StarTech also lists that it is only compatible with (some) Windows PCs. However it is certainly possible to connect two Full-HD displays to a single of the Type-C ports on the 2018 MacBook Pro. These ports are really Thunderbolt 3 ports, so you have a lot of options here. You can buy both adapters as well as full-fledged Thundebolt 3 docks that allows connecting multiple displays over DisplayPort/HDMI as well as adding extra USB-A, USB-C, Firewire, Ethernet, Audio, eSATA or other connections as well as SD-card readers, etc. Some of these even supply power to the MacBook Pro so that you can charge your MacBook Pro over the same, single cable. They also have other variants such as a 12-ports dock and a dock with FireWire 800. 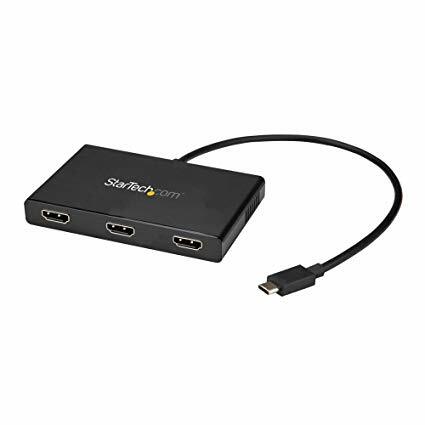 That is a $123.99 dock/adapter with 2 DisplayPort, 1 USB-A and 1 ethernet connectors. Can macbook pro (2016) support two displays on single port?